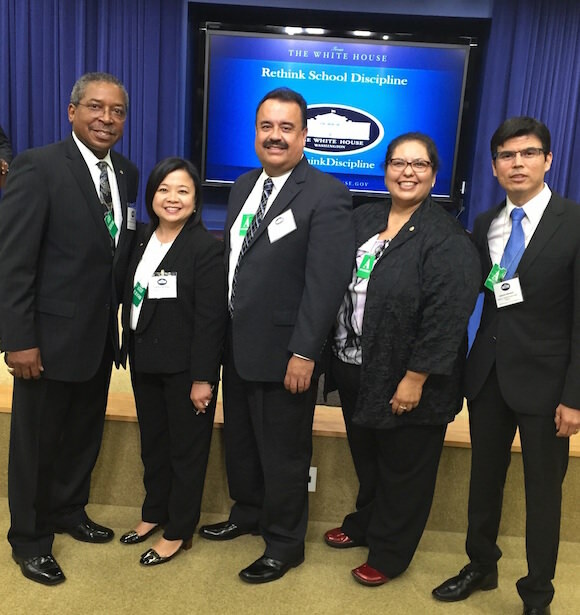 LA Unified’s efforts at reforming its school discipline policies were applauded at a White House national conference yesterday attended by school administrators from around the country. The day-long “Rethink Discipline” conference held up LA Unified as one of five districts that has seen positive results by moving away from “zero tolerance” disciplinary rules. LA Unified board member Mónica García and several district staff members were invited to attend or speak at the conference. The conference literature pointed in particular to LA Unified’s School Climate Bill of Rights, a 2013 resolution authored by García that ended “willful defiance” suspensions, which was a zero-tolerance approach that had led to skyrocketing suspension and expulsion rates, particularly among African American students. As part of the conference, the White House released data that shows suspended students are less likely to graduate on time and are more likely to repeat a grade or enter the juvenile justice system. By taking on “restorative justice” techniques, which focuses on giving students counseling instead of suspensions, LA Unified and other districts have seen rising graduation rates. Last year, the district continued its efforts by significantly reducing the amount of tickets and arrests students received from school police for low-level offenses. The Obama administration has taken up the cause of restorative justice, and the conference featured a number of high-level speakers, including Education Secretary Arne Duncan and Attorney General Loretta Lynch. Garcia said Jose Huerta, operations administrator for the district’s Local District East, addressed the conference about Garfield High School, which has seen increased graduation rates tied to new restorative justice techniques. Garfield, located in East LA, was featured in the 1988 film “Stand and Deliver,” which famously dramatized the real-life success story of calculus teacher Jaime Escalante. “Huerta told the audience about ‘Stand and Deliver,’ and when a kid asked him, ‘Are we as good as the ‘Stand and Deliver’ crowd?’ And he said, ‘You know, that was about 26 kids, and today I am telling you a story about 2,600 kids,’ so it wasn’t just a classroom, it was the whole school,” García said. When asked what LA Unified could do to continue to improve its discipline policies, García pointed to the need for better data collection. García also said as the board searches for a new superintendent, she wants to make sure it hires someone who understands the role that community partner organizations play in restorative justice. García’s school climate committee includes members representing CADRE, Public Counsel and InnerCity Struggle.